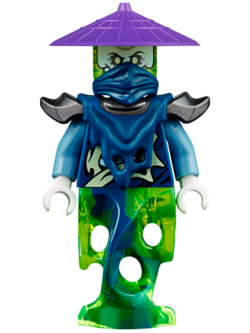 Ghoultar, also referred to as Scythe Master Ghoultar and Ghoultar the Scythe Master, is a Ninjago minifigure released in June 2015. Ghoultar has a Transparent Neon Green head. The front print depicts his face, while the back depicts his skull with a metal patch over a crack. His torso is Earth Blue with printing on the front showing his spine and insides. His arms are Sand Blue and his hands are White. He has a unique piece for his legs that is multi-colored in Transparent Neon Green and Earth Blue. His accessories include a Medium Lavender rice hat, an Earth Blue mask and a multi-colored armor piece. This is a description taken from LEGO.com. Please do not modify it. (see an archive of the product's page) Ghoultar is a powerful ghost warrior, but he's not very bright. He's quick to follow orders, but has a destructive way of going about it. Used in the right way, he can help to win a battle. Give him orders he doesn't quite understand and he can bring disaster down on his own side. Ghoultar is a powerful ghost warrior, but he's not very bright. He's quick to follow orders, but has a destructive way of going about it. Used in the right way, he can help to win a battle. Give him orders he doesn't quite understand and he can bring disaster down on his own side. This page was last edited on 20 August 2016, at 08:04.